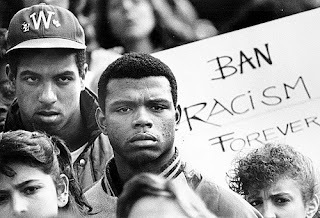 Media Ethics and Society: Journalists: Join the fight to "Ban Racism Forever"
Journalists: Join the fight to "Ban Racism Forever"
Growing up in America, I was often taught that ideals such as freedom, religion and opportunity are at the backbone of America's history. As a child, I was under the impression that racism ended with the Emancipation Proclamation. When I got a little bit older, I thought that racism lasted until after the Jim Crow laws. Now, I see that it is an active part of modern society. As time has passed, I have realized that along with freedom, religion and opportunity, racism is also a part of our country's backbone. African slaves have existed in the United States before the United States officially existed, and the effects of that system still affect our black brothers and sisters today. If you'd like to look at a comprehensive history of racism in the United States, take a few minutes to read this article from the New York Times. I believe that ignorance is one of the biggest hindrances in the fight against racism in the United States. By shoving racism in the corner, we allow the problem to grow like mold on a forgotten loaf of bread. I should not have spent the majority of my life thus far believing that racism is a thing of the past. Part of my history lessons should have mentioned how real racism is in today's culture, teaching me to be an advocate for my friends and classmates. However, I honestly think that my parents and teachers were not aware of how avid racism is today. So whose responsibility was it to inform the adults in my life of racism in our culture? Journalists. I saw my father reading the newspaper every morning and watching the news every night as a kid, and I am sure that many of my teachers did the same. If there had been stories about racism in these publications, I am positive that the adults in my life would have been more aware of them, and as a result would have taught me more about them. It is the responsibility of journalists to inform the public of important issues within our society--on a local, state, and national level. Throughout the years, issues of racism have continually been ignored or pushed aside for other, seemingly more important issues. If our country is going to come together to fight the issue of racism, we must all be on the same page. The one common source that we get our information from is the news, so journalists must be held responsible for reporting on racism. Journalists are also responsible for accurately representing minorities in order not to further racism. The American media is known for spinning stories in a way that dehumanizes minorities. This article from The Root discusses media bias and its effects on black America. One of the best ways for us to fight racism as a country starts with journalists. Journalists have the power to inform or not inform the public, and to be honest or dishonest in their reporting. If journalists come together and choose to accurately report issues of racism, I believe that large strides could happen in America's fight against racism.